Recently, Gogate et al. reported a poor compliance (300 out of 1018 [30%]) of spectacle wear amongst rural secondary school children. 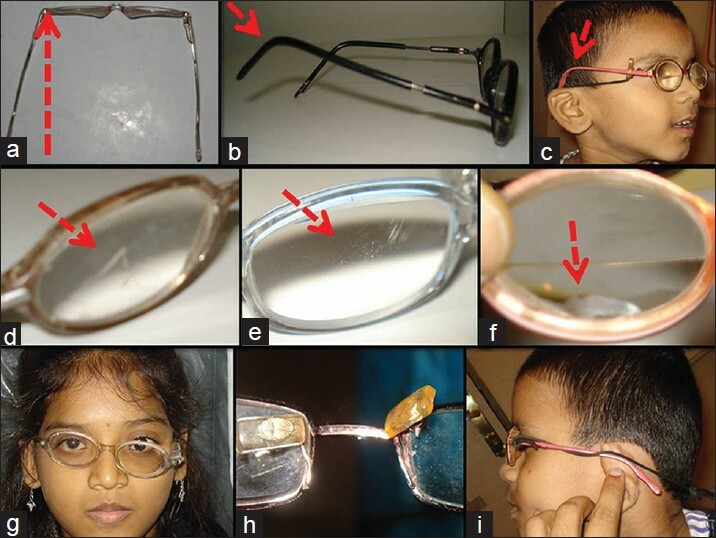 About 17.4% of children in the same study reported "broken spectacles" as the cause of non-wear. In a fresh report, Mohan  stated that about 22% of spherocylinders in adults have optically and clinically significant errors in dispensing. We feel the issue of dispensing spectacle frames and lenses need further evaluation especially in young children. Incorrect frame fitting may have far-reaching consequences on the compliance to spectacle wear and inappropriate lenses would have an additional negative impact on the vision of the patient. We evaluated the spectacles (frames and lenses) of 54 consecutive children based on predefined criteria [Table 1]. The mean age of the children was 8.4 years (standard deviation [SD] ±2.7, range: 5-15 years) of which 31 were males and the average duration of spectacle wear was 9.4 (±6.2, 0.5-24 months). We required a sample size  of 51 patients for group comparison and performed Chi-square test to derive the P value. (n = 2 [Z1− α/2 − Z1 − B] 2Xp[1 − p]/d2 , 80% power, 5% significance, 10% effect size). About 61.1% children used plastic frames, 14.1% used metal frames and 24.1% used combination frames (hybrids). Evaluation of frame fitting revealed good four point touch in 55.6%, fair in 18.5% and poor in 26%. The eye wire was optimal in 62.9% and suboptimal in 38.1%. The nose bridge was graded as not good in 66.7%. The temple parallelism was good in 27.7% and poor in 72.3%. The temple pressure was ideal in only 53.7%. The temple length was adequate in 48% and inadequate in 51.8%. The spectacle lens evaluation revealed a mean decentration of 3.5 mm (SD ± 1.4, range: 1-6). Plastic lenses were used in 94.4% and glass lenses in 5.6%. The lens surface was graded good in 16.6%, fair in 37% and poor in 46.3%. The mean error in the lens power was 0.02D (SD ± 0.5D range: −4.0D to + 1.0D). The mean error in cylinder axis was 4.4° (SD ± 11.0, range: 0-90). Overall, quality of spectacle fitting was 1.25 on a scale of 0-3 (0 = worst, 3 best) and quality-of-lens was 1.67 on a scale of 1-3 (1 = poor, 2 = fair, 3 = good). No statistically significant differences [Table 2] were found in the overall quality of frame fitting or quality of lenses between the age group (less than or more than 7 years [P = 0.7,1.0]), gender (male or female [P = 0.3,0.2]), type of frame (metal or plastic [P = 1.0]) and type of lenses (plastic or glass [P = 0.9]) and duration of wear (less than 6 months or more than 6 months [P = 0.5,0.2]). We concluded that the optical dispensing (frames as well as lenses in its entirety) in children was poor irrespective of the gender, age, type/material of the frame or duration of wear [Figure 1]. More patient (parent) education and responsiveness of the opticians is needed to improve the quality of spectacle dispensing. Both, the frame evaluation and lens evaluation are necessary. It may be advisable that the patient come back with the newly dispensed spectacle for a quality check to the ophthalmologist soon after they are dispensed. 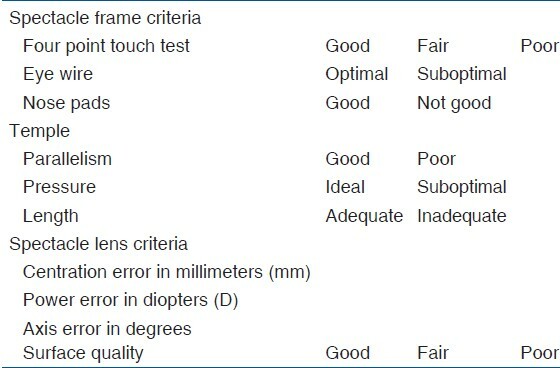 The ophthalmologists must refer to ideal fitting and quality criteria [Table 2] to ensure an optimum lens and frame dispensing. Further studies are needed to assess the impact of improved spectacle fitting and quality of lenses on the compliance of spectacle wear in children, which in turn may translate in the better and faster visual rehabilitation. Gogate P, Mukhopadhyaya D, Mahadik A, Naduvilath TJ, Sane S, Shinde A, et al. Spectacle compliance amongst rural secondary school children in Pune district, India. 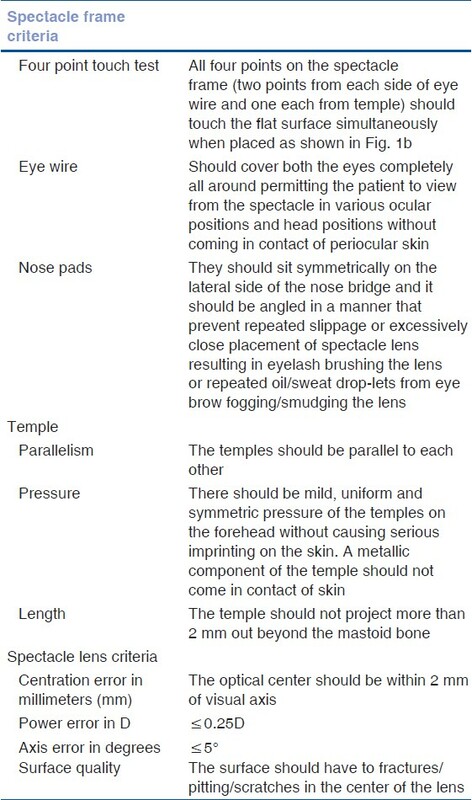 Indian J Ophthalmol 2013;61:8-12. Mohan K, Sharma A. How often are spectacle lenses not dispensed as prescribed? Indian J Ophthalmol 2012;60:553-5. Naduvilath TJ, John RK, Dandona L. Sample size for ophthalmology studies. Indian J Ophthalmol 2000;48:245-50.